The index opened strong around 7950 but saw profit booking to the lows of the day at 7877, dip buying saw the index close flat at 7914.75, small gain of 0.05 points. The broader market was positive with 902 advances to 674 declines. The range for series is at 7500-8100. 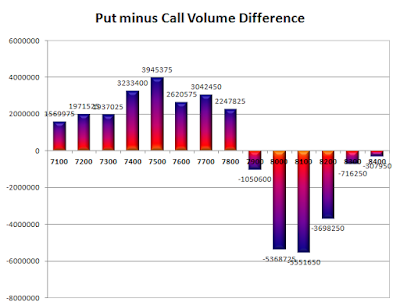 Call option 7800, 8100-8200 added 13.46 lacs OI with short covering seen at 7700 and below strike prices. Put option 8000-7700 added 16.90 lacs OI with profit booking seen at 7600 and below strike prices. 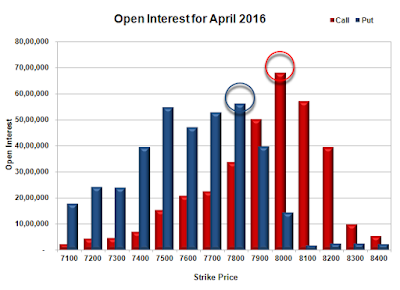 Nifty Open Interest is at 1,63,77,450 up by 5,17,050, with no change in price, most probably long build-up. Bank Nifty Open Interest is at 18,20,490 up by 1,47,300, with increase in price, most probably huge long build-up. FII’s bought huge 22545 contracts of Index Futures, which includes net 17429 contracts long build-up and 5116 contracts short covering, with increase in net OI by 12313 contracts, includes 55772 longs to 33227 shorts for the day. 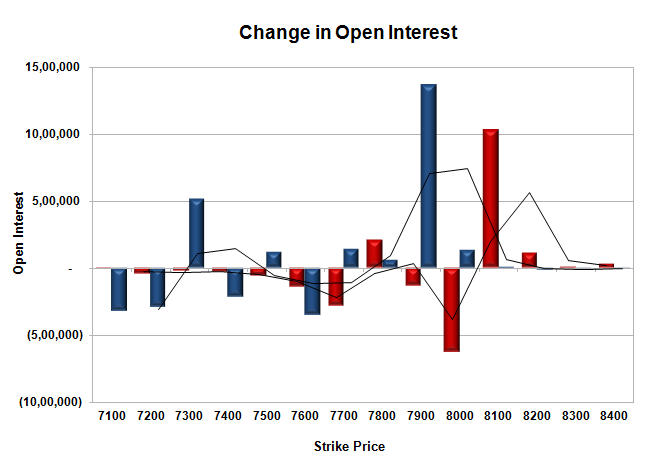 FII’s Index future open contract as on date is 172785 Longs to 81270 Shorts, Net 91515 up by 22545 contracts. Initial support at 7900, with huge OI addition of 13.64 lacs and below that at 7800 with OI of 56.15 lacs. Initial and best resistance at 8000, with highest OI of 68.10 lacs and above that at 8100 with OI of 57.21 lacs. Day Range as per Option Table is 7843 - 7982 and as per VIX is 7844 - 7986 with 7914 as the Pivot.